In this article, A Shade Above Window Fashions—with three convenient locations in Charlotte and Cornelius, North Carolina (NC), and our newest location now open in North Myrtle Beach, South Carolina (SC)—is here to use our window treatment industry expertise to tell you what makes wood blinds from Hunter Douglas so special. We also proudly carry the full selection of Hunter Douglas products. Wood blinds are a beautiful addition to any home, adding timeless style to any room. 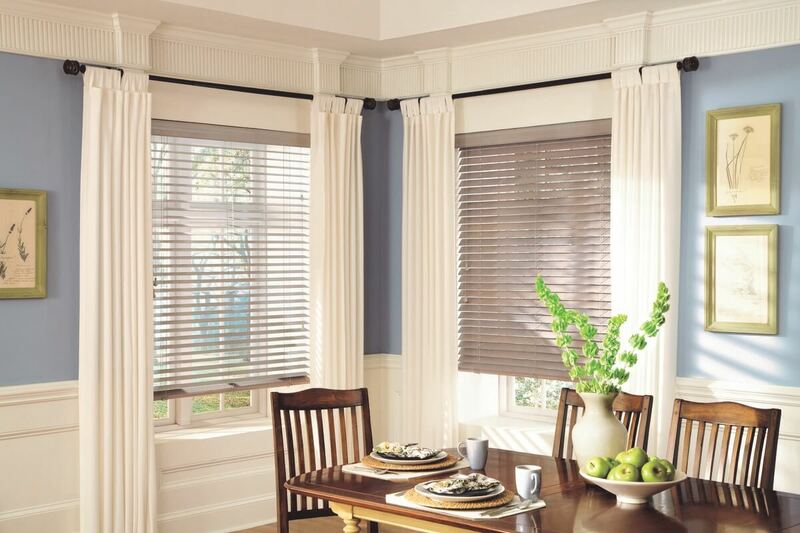 The Hunter Douglas Parkland® Wood Blinds feature traditional style and beautifully rich wood. They are made from real hardwoods which provide your home with a natural, warm, and organic feel, making them visually appealing in any setting. What makes these wood blinds special is the sophistication and refined qualities that real wood imparts to your home. With the Parkland® blinds, you can even choose a beautiful Parkland® wood cornice, which is a beautiful addition to any window treatment. These cornices are constructed from 100 percent domestic wood with detailed hand-craftsmanship. They are available in a variety of customization options including styles, heights, and decorative options. Wood blinds are great because they can fit with just about any décor that you may currently have. They come in a large array of beautiful colors, stains, and types of wood for you to choose from to fit anywhere within your home. Another special point is wood blinds are also great insulators. Because of their strong wood construction, they insulate your home from extreme cold or heat, making your home more energy efficient. They even protect your home furnishings and possessions from the sun’s harsh UV rays, which tend to damage these items. No one wants to worry about the sun fading their furniture. These blinds are also great for privacy, so they are perfect for any room, including bedrooms and bathrooms. Opposite to faux-wood blinds, authentic wood blinds are extremely light weight. This is a benefit for larger, taller windows because you don’t want your window treatments to be too heavy, as it can eventually strain and possibly damage the operating system. By choosing lighter real wood blinds, you can be sure they will last much longer and be easier to open and close. Also, because of the lightweight material, they don’t require as many support strings, called ladders, as required in faux wood blinds. Since they don’t need as many ladders, they provide a more seamless, shutter-like appearance from interior and exterior views. Though they may be a bit more expensive than faux wood blinds, these blinds will last you much longer. A Shade Above Window Fashions offers a variety of options for beautiful wood shades in all of our showrooms. We have locations in Charlotte and Cornelius, North Carolina, and our newest location in North Myrtle Beach, South Carolina, where you can browse samples of our amazing Hunter Douglas products and interact with them. You can even test out the variety of operating systems. Our incredible team of professionals is committed to helping you find exactly what you are looking for. Because of our four separate locations, we are proud to say we can serve the entire greater Charlotte, NC area and beyond.